Olivia Woolley Meza is a postdoctoral researcher at the Chair of Sociology, in Particular of Modeling and Simulation, at ETH Zurich. She’s an expert on mathematical models of the dynamics of complex systems. She holds a BSc in Math and Computational Science from Stanford University and a MSc and PhD in Engineering Sciences and Applied Mathematics from Northwestern University. She has studied the resilience of complex networks, for example the impact that the eruption of Eyjafjallajökull and other geographically structured disruptions have on global human mobility. She also works on modeling the spread of epidemics and understanding how the information individuals use to make vaccination decisions can transform the effectiveness of voluntary immunizations. 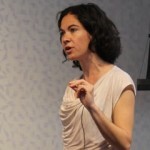 The focus of her current work is on how information interacts with, and critically alters, spreading processes in complex socio-technical systems.